Image caption The UK insurer reported a 17% rise in operating profit for the six months to the end of June. Prudential has seen profits rise in six months to the end of June after a strong performance in the US and Asia. The UK insurer reported a 17% rise in operating profit to £1.5bn compared with the same period last year. It said its US business, Jackson, had generated operating profit of £686m, up 28% on the same period last year. The group has been "focusing on growing high quality insurance margin and fee income," said Prudential's chief executive Tidjane Thiam. Prudential shares made the biggest gains on the FTSE 100 share index on Tuesday morning, up over 2%. Fee income from Prudential's US business and sales for health and protection products in Asia helped drive up profits, Mr Thiam said. 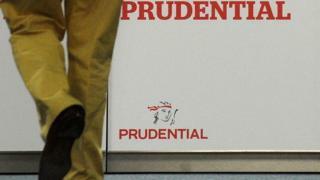 Prudential's operating profit in Asia rose 19% to £525m, in spite of "challenging conditions" in South-east Asia. The firm's UK profits also saw a 10% rise to £374m, despite the market "undergoing significant regulatory change", he said. There has been "significant disruption in the UK life and pension market where annuities sales decreased markedly following the Budget announcement," he added. The Budget heralded a change in the pensions rules that will mean a retiree can draw their entire pension in cash in one go if they want. The rule change will fully come into force in April but temporary rules are in effect already. The UK pensions market has already been affected by the change in rules. Insurance group Legal and General said individual annuity sales were down 49% in the first half of the year to £383m. It expects a 50% fall in sales in both the second half of this year and in 2015. Insurer Aviva said that the value of new annuity business had fallen by 41% since the Budget reforms were announced.